Getting proper care for one’s disease has never been easier. Companies, both big and small, have access to incredible technologies that make the lives of patients much more comfortable. Keeping tabs on one’s vitals is as simple as telling the time, with microprocessors, vital sensors, and high-contrast displays being widespread commodities. This trifecta of elements has been simply put together into what now we call the oximeter a pulse and blood oxygen monitoring device that fits on the patient’s fingertip. This non-invasive and accurate device is perfect for people who don’t want to spend precious time on constant doctor appointments—which are both inconvenient and kind of depressing. That being said, they are still important, but this device will definitely reduce their frequency. Either for the determined athlete or the fragile patient, these devices are very useful in determining the next steps in recovery. Let’s continue by taking a look at such a device, namely the AccuMed Finger Pulse Oximeter, a well-designed gadget that provides accurate vital readings. Accumed has a lot—and we mean a lot—of health-related products and expertise in tens units and pulse oximeters. Their expertise in the field provides users with a good product design along with convenient and easy-to-use features. With dozens of products and a name that’s slowly becoming notorious on the market, it’s hard not to find something satisfying. With a bulky design, the AccuMed Finger Pulse Oximeter stands out from the run-of-the-mill device. The sturdy plastic and the silicone cover make the outsides durable and reliable. The spring system is designed in such a way that anyone can get accurate readings, even children. That being said, its recommended use is for people over 30 kilograms in body weight, so keep that in mind. The front pulse and oximeter display features simple numerics on an LED screen, resembling an old digital clock. The reading process is straightforward; with just one control button being available, it’s more accessible for the not-so-tech-friendly users. Running on two AAA batteries, the user will have no problem in getting it up and running. It’s good for about 40 hours on a fresh charge—around 10,000 readings. While it’s not intended for medical use per se, it provides good guidelines to those who need a quick reading. It’s great for patients suffering from lung-related conditions, athletes who spend a lot of time at high altitudes, and pilots. Having low blood oxygen levels is very serious and should be treated with a lot of caution, making AccuMed Finger Pulse Oximeter a rather small yet valuable investment. That being said, it’s not perfect. Without proper approvals from authorizing bodies such as the FDA and CE, it can’t be marketed and sold as a piece of medical equipment which hurts its credibility. The spring system is also somewhat flimsy, so the user has to be very gentle with it to ensure it has a longer lifespan. While this is true, this item does come with a one-year money back guarantee that gives the potential buyer some much-needed confidence. The next section is meant to decide how good (or bad) the AccuMed Oximeter is by comparing it to a product from its own category. In this case, we’re going to take a look at the FaceLake FL400 Pulse Oximeter, a valid alternative to the AccuMed item, and decide whether or not it’s a better choice for the consumer. To keep it short, the FaceLake product is a pretty solid choice for casual use, but it’s highly recommended to go with the AccuMed product for the best results. While the AccuMed could use some improvements, the FaceLake oximeter has some pretty big drawbacks. 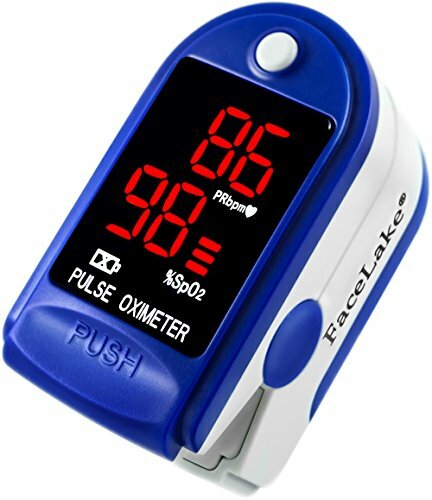 FaceLake oximeter’s reading time is longer with the user having to wait several minutes to get an accurate reading. Since the battery cover is very poorly made, it gets damaged easily and causes the batteries to fall out during normal use. Lastly, the accuracy isn’t the best, making the AccuMed Oximeter a clear winner in all categories. 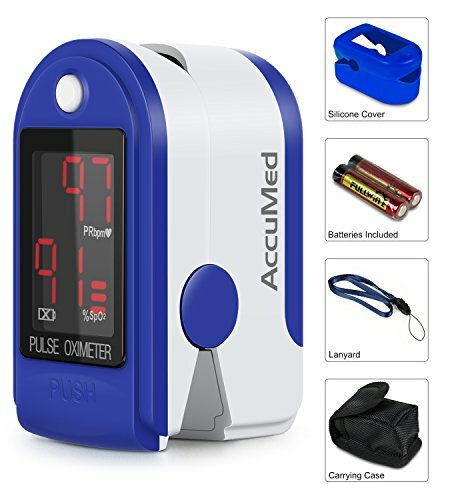 Staying in line with the other AccuMed products, the AccuMed Finger Pulse Oximeter is a great choice for casual use. Providing consistent readings, this oximeter lets users easily determine when it’s time to take a break or change something in their routines. It passes every test with flying colors, giving timely and accurate readings to people of all ages and sizes.